What Can You Feed Ducks Besides Duck Feed? What can you feed ducks? Should you give them more than just duck feed? Find out here. Raising ducks in your backyard is a great way to get fresh eggs, entertainment, and quality compost. But, when it comes to a duck’s health, knowing WHAT to feed ducks, as well as what not to feed ducks is important. Keeping your ducks healthy will result in longer life, better quality eggs, and MORE duck eggs being laid. Ducks that get sick or are malnourished tend to lay eggs less often, and they can be of poor quality when they do. So, what exactly should you feed ducks as a treat? What do ducks eat? Please keep in mind that regular Duck Feed is a must for all ducks in your flock. They need the nutrition from this on a daily basis. Fresh water constantly is also a MUST for your flock’s optimum health. Grit: Ducks that have access to dirt will pick up small stones on their own and don’t need supplemental grit offered. If your ducks are kept in enclosures without access to dirt, sprinkle a small amount of grit on their food once a week. Oyster Shell: Oyster shell is not usually necessary if your laying ducks are on a good quality-laying ration. If despite a good diet your ducks are laying pitted or thin-shelled eggs, you may choose to supplement for additional calcium with crushed oyster shell. Lettuces– Especially ice burg, should be given in small quantities due to lower nutritional value. Other types include Romaine, Bib, Butter, Radicchio, etc. Cucumber– Feed this uncooked, peeled, or unpeeled. Chop up in small cubes. 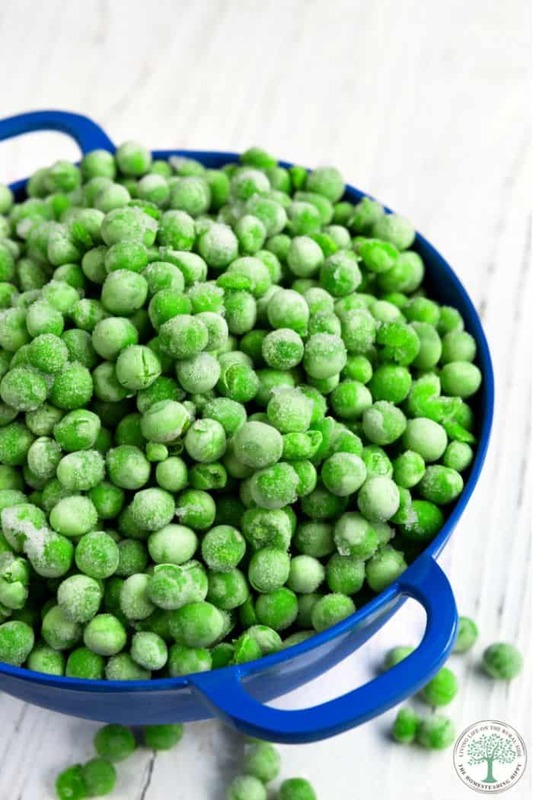 Frozen Peas– Fresh or frozen/thawed are best. Canned peas tend to have too much salt for birds. Try keeping a bag of thawed peas in the fridge for treats, or to “train” your ducks to go to bed at night. Green Beans– Cut into small pieces, or give them the ends and tips when you trim beans for yourself. Tomatoes- All kinds, the flesh only, NO vines/leaves as they are toxic to birds. Cherry or grape tomatoes that have been cut in half are a favorite among our ducks. Apples-Applesauce is a messy treat, but ducks love it. Try mixing it with other fruits or veggies to help contain the mess a bit. Leave the seeds out, as even a small amount of the apple seeds can be toxic. Grapes-Red or green, cut in half. You can also give them raisins. Melons-Cantaloupe, watermelon, or honey dew are great cut into smaller pieces. Our ducks will eat the rinds of watermelon if it is cut up into smaller pieces. Eggs- Scrambled or hardboiled, chopped with shells intact. Do NOT give them raw eggs, though. The shells are a good source of calcium, instead of buying oyster shell from the store. Dry cat food-Our ducks LOVE to eat the cat’s food, and will often skip their own pellets in favor of the salmon flavored kitty chow. I do make sure they don’t get too much of this “treat”, so the cats actually get fed. Rice- As a once in a while treat, try adding soft cooked rice with some other veggies or fruits. Do not give them uncooked rice, as it can expand in their crop when they drink water. Seeds– Some seeds, like millet or sunflower, can be given to ducks as a limited, rare special treat. While seeds such as grit can be used, they do not digest well and can fill the crop with material that is not digested or passed. This can lead to serious digestive issues in ducks. Here are some things that you shouldn’t feed ducklings, adult ducks, or wild ducks. These can cause digestive issues, or be outright toxic to your ducks. If you have fed these to your ducks before without issues, you should consider yourself very lucky. Bread, chips, crackers Packed with carbs that ducks don’t need, bread, though soft, can become dense in the stomachs of ducks. Ducks can also binge on this “tasty” treat and end up with an impacted crop. An impacted crop can result in death! Onions– Sometimes they cause diarrhea or vomiting. It is best to avoid giving your ducks onions. Avocados– All parts of the avocado, including flesh, pits, skin, and even parts of the tree are very toxic to ducks! Leave the guacamole out of their enclosures, please. Sugary, Salty, High Fat Foods- If it isn’t healthy for a human to eat, neither is it healthy for your ducks. Even small amounts of these foods will have a negative impact on your duck’s health. Anything fried contains far too much oil/fat for your duck. Canned veggies contain too much salt. Canned or in-juice fruits contain too much sugar. Ducks who consume these foods can become overweight and have other health issues, and they will typically die at younger ages. These are just plain NOT HEALTHY. 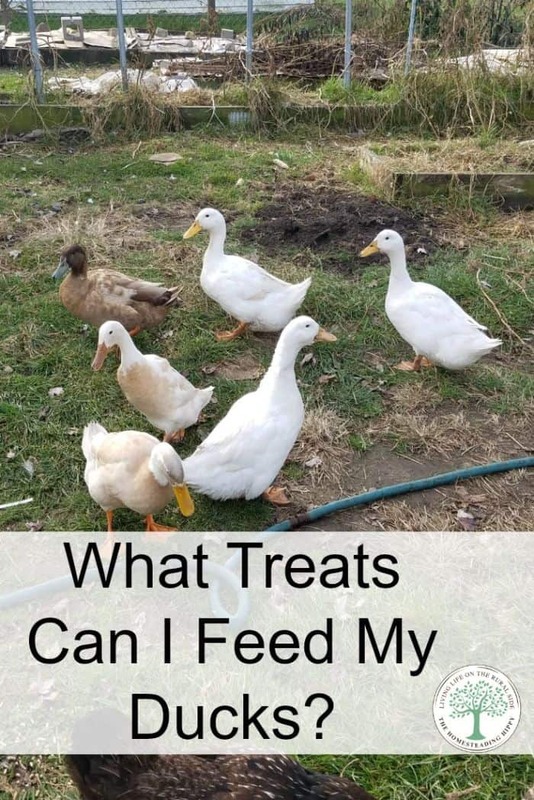 This list gives you some ideas of what you should feed your ducks as treats and what you should avoid giving them. Did any of these items surprise you? Be sure to pin this for later! Love it, Heather! Thank you!! We are planning on adding ducks this spring and I need all the help I can get! That’s so exciting! I can’t wait to hear about your experiences!! I have a couple of Muscovy hens in with my chickens and they are on a really good layer feed along with cracked corn. I am a backyard chicken/duck farmer. I have found that mine LOVE a little cooked spaghetti, cooked Al Dente’ . This is just a special treat for them. I also save all of my skin, and excess pulp when canning tomatoes, bag it, freeze it. Then, even in the winter they love to eat them. I grow small of amounts of wheat in containers in the house for them so they have some greens in the winter. They are very spoiled Ducks. They haven’t started laying yet, they are still young, but I can’t wait for the eggs! the eggs are SO delicious! Let me know how you like them! Hi Heather I live on a river, I raised my 2 ducks from babies. I’d love to let them roam the backyard but I’m afraid if they go in the river they may not come back. Our river never freezes so we feed the wild ducks all winter I’d just like to keep my ducks from turning wild. What do you advice? For my experience, ducks tend to stick close to where they know they are safe. Personally however ,I would keep my ducks away from the open river, more for their own protection than worry about them leaving.